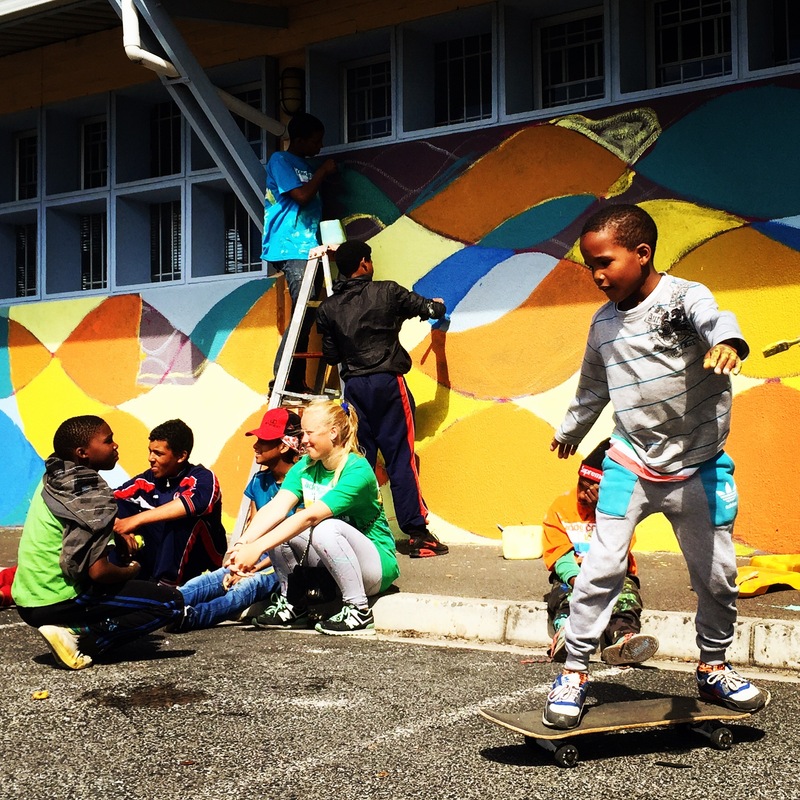 As I write this, I’m flying home to Brooklyn after an incredible two months of non-stop community mural projects for the #AddColourToLives initiative. There have been highs and lows, excitement and exhaustion, and so many interesting and inspiring people who I’ve met along the way. 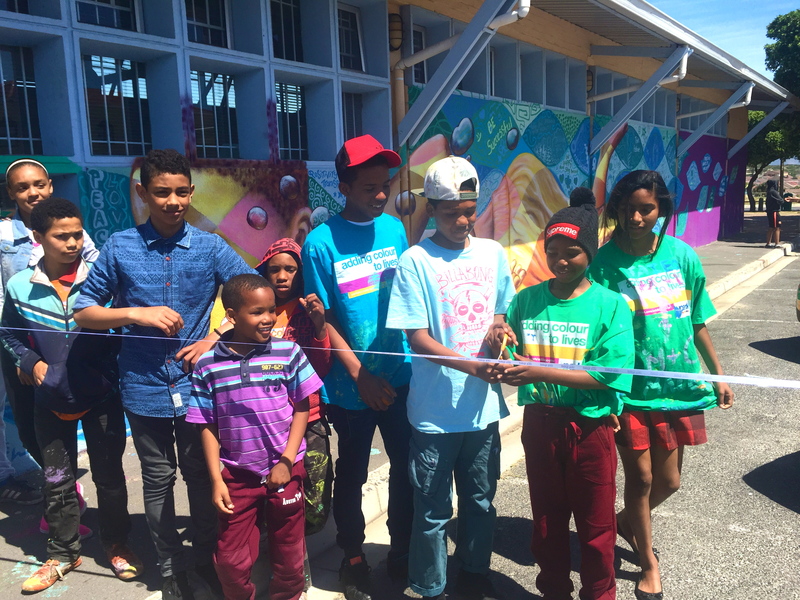 The final project took place in Cape Town, South Africa, in a remote community called Strandfontein, where we painted the exterior walls of the public library. The project partners included two Park Inn hotels in Cape Town, the You2Africa organization and the youth program 9 Miles Project. 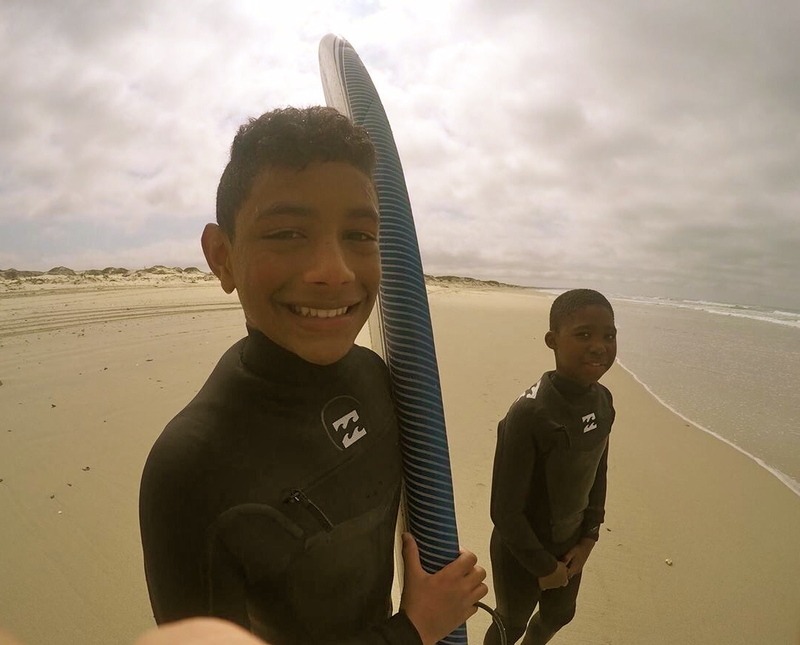 Founded by Nigel Savel, 9 Miles engages children from a nearby informal settlement through surfing and skating. I was greatly moved by what an important father figure Nigel had clearly become in the kids’ lives and the family-like bond that they had formed. Surfing had become a central focus in their lives and a catalyst for making positive connections with their peers and adults in their community. This connection is essential for guiding these young people into a healthy and safe future, no small feat in an area rife with violence, substance abuse and broken lives. The first day, I led activities and games with the kids and gave a presentation on mural art. Together, we discussed the theme and imagery that the youth would like to paint in their mural, and I guided them through the design process. For the next week, we met every day to paint, and on a couple mornings the kids took me surfing and taught me some of their techniques! The Park Inn and 9 Miles staff members were all on hand, and we all bonded over painting and conversation. Renaldo, a media specialist, documented the project with photography and video, and streamed the project live on the app Periscope. The project became a hit, with up to 900 people a day tuning in from around the world! 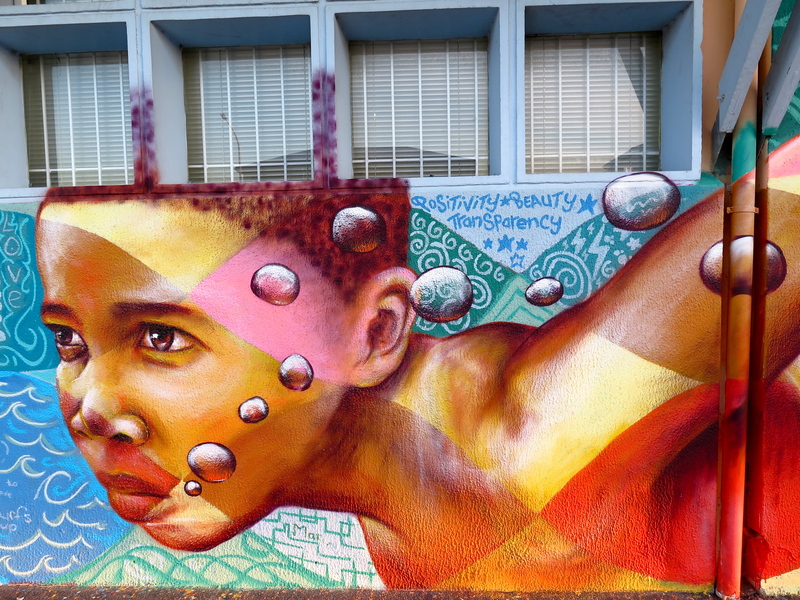 The mural included a girl from the group surfing on a book, referencing their passion for surfing and the importance of learning. One of the participants, Lizé, wrote a poem on the book. Another section shows a giant shark, which is filled with monster-like faces that are the kids’ interpretation of the negative elements in their everyday environment: crime, violence and lack of opportunities. Around the corner is a boy, modeled by a participant named Bibo, who is swimming directly toward the shark, confronting him with a look of determination on his face. All around him are the youths’ expressions of the positive elements surrounding them as they work to overcome the negativity, such as family bonds, education, friendship, and positive adult role models. A final section depicts a tree growing from the ground and winding its way onto the walls, where the participants wrote and drew all the ways in which they had grown in their lives and what they dreamed of for their future growth. On the final day, we had a ribbon-cutting ceremony and invited the community to see the mural. Many of us gave speeches about what the project had meant to us, including a couple of the kids. I then had the opportunity to visit the informal settlement where the children live, and they invited me into their homes to meet their families. It was a pleasure to work with these vibrant, highly animated young people, full of attitude and youthful energy. They were so proud to present their accomplishment to their community. Thanks to them and to everyone at the 9 Miles project and the Cape Town Park Inn hotels!! Renaldo and the kids interacting with our global viewers via the Periscope app.